Want to make your special day different? 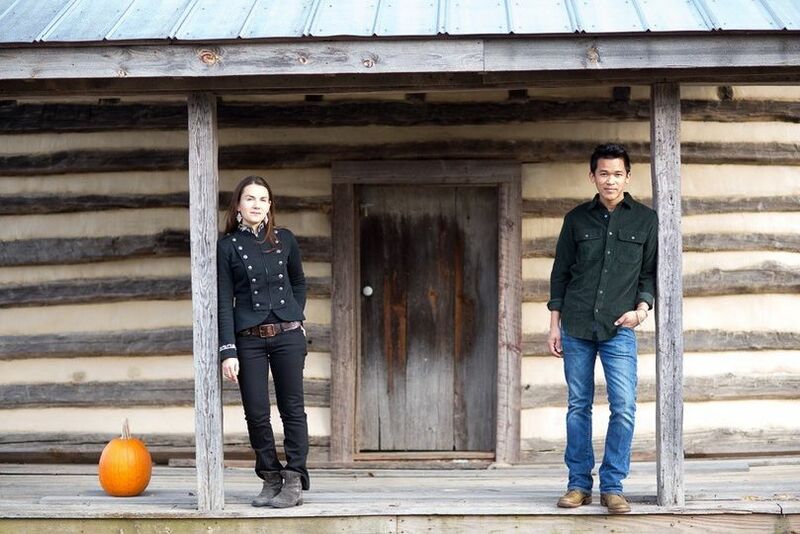 If you are considering options for music, Morwenna Lasko & Jay Pun are your answers. 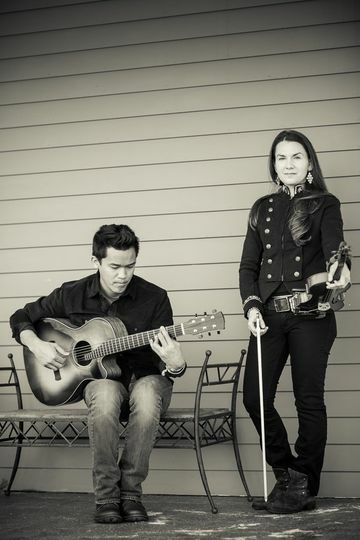 This violin & guitar duo are unlike any other group you might have come across. These two have the ability to naturally sound beautiful yet unique, familiar yet fresh, all because they have that special something that's beautifully uncommon. They play the usual standards like "Canon in D," "The Wedding March," traditional tunes like "Ashokan Farewell," "A Lover's Waltz," original tunes like their upbeat "Just a Little Ditty," or "One Moore." But maybe you have a favorite song, like "Heavenly Day" by Patty Griffin, "Wagon Wheel" by Old Crow Medicine Show, "In Your Eyes" by Peter Gabriel, or even an obscure Radiohead song. Want your guest talking for days after your event? Whether it be your wedding ceremony, cocktail hour, private party, or art opening, try something different and have the sounds of Morwenna Lasko & Jay Pun be the icing on the cake. King, Ben Sollee and Jake Shimabukuro to name a few. 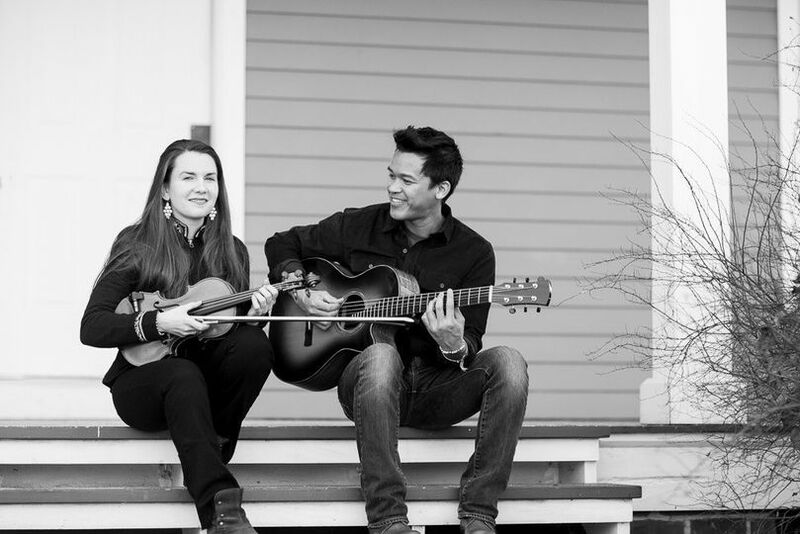 Both graduates of Berklee College of Music, the Violin & Guitar duo started playing together in 2004 and have continued to push the boundaries of "acoustic" music. The release of their highly anticipated 2nd CD "Chioggia Beat," illustrates their ability to reinvent the limits of their instruments and in the process produce a lush range of original work that is sure to move your soul and mind. A worldly mix of 12 tunes, the album showcases Morwenna and Jay's heartfelt composition skills, along with their knack for introducing unexpected musical tangents and motifs in a way that keeps you wanting more. The CD features their signature duo sound, their full band, as well as a few special guest musicians such as legendary world artist Pierre Bensusan, soul singer Ezra Hamilton, and Dave Matthews Band trumpeter Rashawn Ross. Jay started his musical venture with the piano, studying classically at the age of 5. Soon after, the guitar was picked up accidentally when his middle school band member did not show up to rehearsal and someone needed to fill in. During high-school he studied with jazz/blues guitarist Jamal Millner and became fascinated with funk music when he discovered the sound of groups like Parliament Funkadelic and The Meters. One day, his Spanish teacher told him that world renowned finger-style guitarist, Pierre Bensusan was playing a show in town and suggested that he should attend. After that concert Jay's perception of how the guitar was played changed forever. He was so taken by the performance that he later studied with Bensusan at an intensive master class held in Chateau Thierry, France. After graduating high-school, Jay moved straight to Boston, MA to enroll at Berklee College of Music where he studied songwriting, music business, and performance. Now performing & writing with Violinist, Morwenna Lasko, Jay has truly developed his own unique sound, blending all of his influences from classical to jazz, funk to world beat. As he often says "the best musicians know that there's a lot left to learn." It wasn't until the last semester at Berklee during a "Music of India" class, where Morwenna and Jay met. After becoming friends and discussing similar interests in music, Jay told Morwenna about the Charlottesville, VA music scene (of which he is a native) and they both moved there in the fall of 2003. They immediately started teaching private lessons, doing session work, and playing in a few different projects. They soon discovered that playing music together and working on their original work as a duo was much more fulfilling. With no one telling them what or how to play, they discovered a creative freedom that only comes from stepping beyond the confines of genre music. Thus began their amazing creative journey. 2 albums & hundreds of shows later, they are making a mark on this world with their explosive music. Blending together World, Jazz, Funk, Blues and more, these trailblazers continue to push the envelope and will not stop. Together, they have shared shows with such greats as Vusi Mahlasela, Julian Lage, Bela Fleck & The Flecktones, Dave Matthews Band, Avett Brothers, Toubab Krewe, The Duhks, Frank Vignola Quintet, Jesse Colin Young, Ralph Stanley, Corey Harris, Ben Taylor, and more. They've also had the great pleasure and honor to play at some wonderful festivals and clubs such as FloydFest, The Festy, Smoky Hill River Festival, Bristol's Rhythm & Roots, The Prism Coffeehouse, Club Passim, Eddie's Attic, Down Home and more. "Morwenna & Jay have performed at our events many times..and without fail our clients are always absolutely thrilled with not only their sheer musical talent but the sense of joy and enthusiasm that they bring to every event." "As an event planner, I've worked with Morwenna & Jay over the past years in and around Charlottesville. Besides being extremely talented musicians, they are easy to work with from an event planning stand point. They are very communicative and can be flexible in terms or start time and ends times. 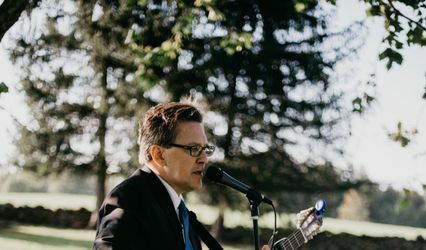 They are definitely one of my favorite local groups...and I never hesitate to recommend them to a client who is looking for a unique touch during their ceremony or cocktail hour. Their music is memorable, that's for sure!" 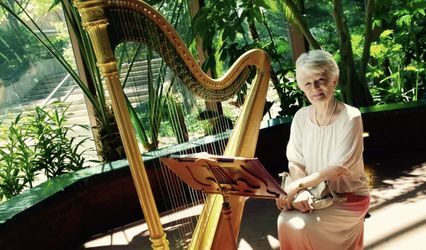 "The music of Morwenna Lasko and Jay Pun was the perfect accompaniment to my wedding day. Jay and Morwenna helped me select music that set the exact atmosphere I wanted for the ceremony. They were a delight to work with and did an excellent job. The day would not have been the same with anyone else!" "It has been an absolute pleasure booking Morwenna and Jay for weddings and special events the past several years. Not only is the quality of their music fantastic, but they are two of the most genuine, down-to-earth performers around. Their talent level on their respective instruments is stunning, and they have composed some truly original, beautiful music over the years. Every client and industry professional I have had them play for has raved to me and thanked me for setting Morwenna and Jay up for their special events. This duo is wonderful for just about any type of event ... weddings, corporate events, concert series, etc. 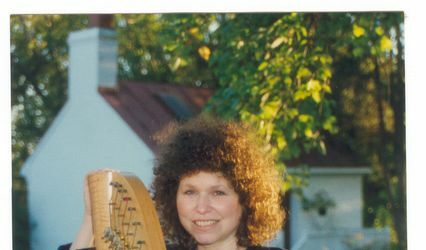 You name it, and Morwenna and Jay will provide a beautiful musical ambiance." "Morwenna Lasko & Jay Pun are highly experienced professionals in the music business that are fantastic to work with and top notch musically. Whether they need to cater to a private client/wedding or play a festival concert, they have the versatility and wherewithal to execute any event flawlessly. 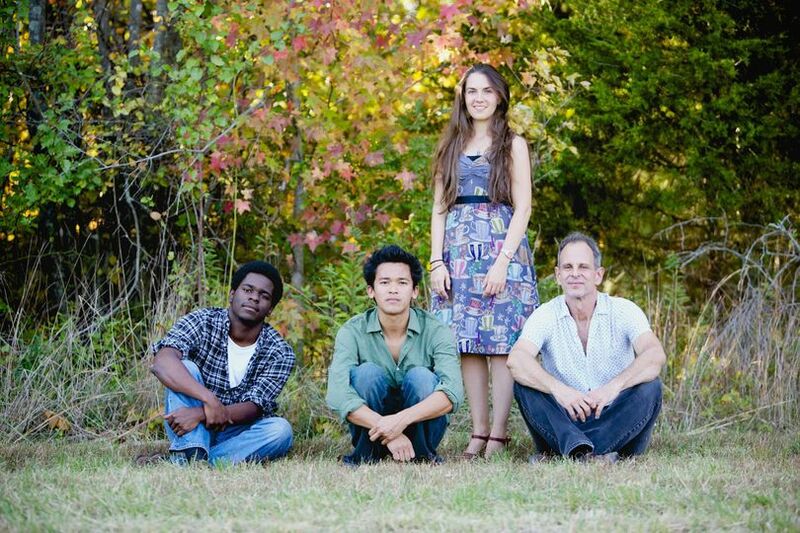 Their sound is one of the most organic, original and soul warming of any act you will find out there. I could not recommend them more highly to any client regardless of the event type, based on their diversity, elite talent, and professionalism. These guys were simply amazing! They played mostly original tunes for our wedding ceremony and cocktail hour and I couldn't be more pleased with how it all turned out:) They are SO talented and I had many guests comment about how wonderful they were! They added the unique touch that I wanted for the ceremony (they are not just another string quartet playing Pachelbel's Cannon in D). They really set the mood and it was simply amazing:) On top of all that they were so nice, responsive, and easy to work with throughout the whole process! Do yourself and favor and hire them!